Over-the-counter pain medication is something that a lot of people take without thinking much about it. Whether it’s a headache or painful joints, it is not uncommon to pop painkillers, such as Tylenol or Advil, on a pretty regular basis. A recent study, however, has given reason for pause. The American Journal of Epidemiology published a study which concluded that just over 1 in 20 cases of hearing loss in that study could have been due to using painkillers (full article available for free here). There is, however, an important caveat to these findings. The study only looked at the impacts of painkiller use on hearing loss in women. This decision is interesting because men are actually almost twice as likely as women to experience hearing loss! This study makes clear, however, that hearing loss is not discriminatory – it can affect anyone. It is important to identify any potential links between our lifestyles and hearing loss, especially when we consider that approximately 37.5 million Americans report some trouble hearing. The study’s findings may make you think twice the next time you get a headache or pull a muscle. Hearing loss often occurs due to damage to the inner ear, so it’s no surprise that this is where researchers are pointing in terms of links between hearing loss and painkillers. The researchers in this study, coming from Harvard Medical School, Harvard TH Chan School of Public Health, Vanderbilt University, and others, believe that over-the-counter pain medication may reduce blood supply to the inner ear. This reduction, they hypothesize, removes protection and damages the small hairs that receive and transmit sound to the brain. They believe that this may result in hearing loss. The painkillers looked at within the study included the types of over-the-counter medications that many of us take regularly, such as ibuprofen, paracetamol (or acetaminophen) and aspirin. Ibuprofen: The results relating to Ibuprofen were the most alarming. The study found that women who use ibuprofen twice a week for one year or more had a higher risk of hearing loss than women who do not use ibuprofen regularly. Regular use of ibuprofen over 1-4 years was linked to a 7% increase in risk of hearing loss, and this percentage continued to rise the longer painkiller use took place. Four to five years’ usage was linked to an 8% increase in risk. 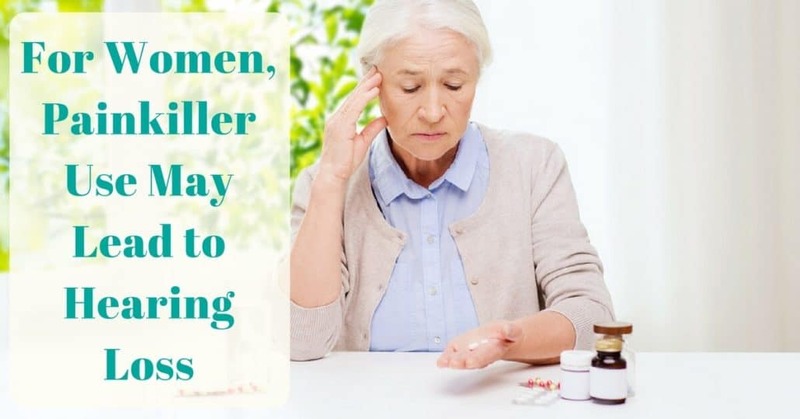 The most worrying result, however, was that the study found that women who use Ibuprofen twice a week for six years were at a heightened risk of developing hearing loss by 10%! Advil and Motrin contain ibuprofen. Acetaminophen (aka paracetamol): Researchers found that the risk of developing hearing loss was heightened by 9% for women using painkillers for six years or more than when compared with less than one year of regular use. The good news, however, is that researchers considered that a link only exists if women use this type of painkiller for six years or more. Aspirin: Previous studies have linked aspirin to hearing loss, but this study found that aspirin was not linked to hearing loss. This is thought to be the case because most people use low-dosage aspirin nowadays. This study used data from a population-based study focusing on American nurses, which ran over a long period of time. These types of studies are useful for spotting links and patterns between different factors. Nevertheless, the researchers were unable to objectively measure the degree of hearing loss because they used self-reported rates of hearing loss. The study cannot therefore be considered conclusive. Although the study was not conclusive, other studies have had similar results. For this reason, the researchers believe that their findings are consistent with existing medical research. It should be noted, however, that the majority of women surveyed were white, so we do not know the implications for non-white women. The study does give reason to pause if you take painkillers regularly, as it could result in harmful impacts to your health over time. It should be emphasized, however, that if you’re in pain, don’t be scared to have a few ibuprofens here and there! If you find that you need to use painkillers every day, however, you may wish to consult your doctor about your pain levels. If you are concerned about difficulties with hearing, or you want to be proactive in combating hearing loss, don’t delay contacting a member of our team. Early prevention is key! If you are a candidate for hearing aids, our hearing instrument professionals can work with you to find the best hearing devices to fit your lifestyle.